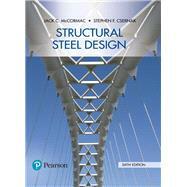 by McCormac, Jack C.; Csernak, Stephen F.
For undergraduate courses in Steel Design. This best-selling textbook addresses the fundamentals of structural steel design for students pursuing careers in engineering and construction. Presented in an easy-to-read, user-friendly style, the 6th Edition conforms to the latest manual and specifications of the American Institute of Steel Construction. The material is best suited to students with a basic understanding of the mechanics of materials and structural analysis. Jack C. McCormac is a retired Clemson civil engineering professor named by the Engineering News Record as one of the top 125 engineers or architects in the world in the last 125 years for his contributions to education. McCormac has authored or co-authored seven engineering textbooks, with more than half a million copies now in print. His current books have been adopted at more than 500 universities throughout the world. McCormac holds a BS in civil engineering from the Citadel, an MS in civil engineering from Massachusetts Institute of Technology and a Doctor of Letters from Clemson University. Named an Alumni Distinguished Professor, he taught at Clemson for approximately thirty-four years before retiring in 1989. He is included in the International Who's Who in Engineering. Stephen F. Csernak is a Senior Lecturer of Civil Engineering at Clemson University. He earned both his B.S. and M.S. degrees in Civil Engineering from Clemson University. Csernak’s research interests include: Structural Engineering, Wind and Seismic Design, and Professional Registration. Registered as a professional engineer in South Carolina, Virginia, and Kentucky, Csernak is also a member of the American Society of Civil Engineers, the National Society of Professional Engineers, the American Concrete Institute, and the American Institute of Steel Construction.